Giò (Homepage) wrote: I tuoi macro sono sempre stupendi!!! Angad (Homepage) wrote: This is a great shot! Lovely composition. Vincenz (Homepage) wrote: Sweet. I like how you have positioned the bug in the photo. grant (Homepage) wrote: superb macro! Tom (Homepage) wrote: Great macro. John Maslowski (Homepage) wrote: Exceptional macro shot, lovely details and colors. The lighting and processing is perfect, great contrasts and DOF. oldshutterhand (Homepage) wrote: Interesting collection of red tones. Marcie (Homepage) wrote: Fantastic detail. Not sure what to say..that hasn't already been said. Exquisite image! sherri (Homepage) wrote: Just beautiful! Colors Inc (Homepage) wrote: really cool composition, love it! Marcah (Homepage) wrote: Wonderful composition. Love the colors and bokeh. cashondeo (Homepage) wrote: Precioso colorido en toda la foto, y muy bonito el foco sobre la mariquita ! beanow (Homepage) wrote: MIRACULOUS! Under every regard... The splendid work Paolo! Denis (Homepage) wrote: What a beautiful colour palette ! really!nice! Tom (Homepage) wrote: The colors are really nice on this one. Nice Macro capture. lgb (Homepage) wrote: Excellent macro! Great colors and composition! Lunamania (Homepage) wrote: The contrast in focus really works here and great pink/red tones. Hope she makes it to her destination. Siam (Homepage) wrote: It is so ingenious this ladybug, picture in state of more on top of that spread. Olivier Jules (Homepage) wrote: great shot! Abel (Homepage) wrote: I find ladybirds to be a good subject to photograph. I usually try to take a picture of them when they have a more contrasting background, maybe a green leave, but even though that in this picture it is not the case, i think it really works. A.
Ivar (Homepage) wrote: Great close up, really like the colors and the dof. And the ladybug is dead sharp, very nice. Andres (Homepage) wrote: Lovely colours of this close-up. 613photo (Homepage) wrote: I'm not into nature shots, but this is great and I'll tell you why I like it. It is masterful composition. You have the lady bug and her stem or stick or whatever in the left fifth. But not only that, her background is black which really brings her out. The rest of the bacground is beutifully out of focus and is extremely colorful, however it is not a distraction because of the deep shadows behind the subject. This was very well thought out. martie (Homepage) wrote: Beautiful macro. Love all those shades of red! 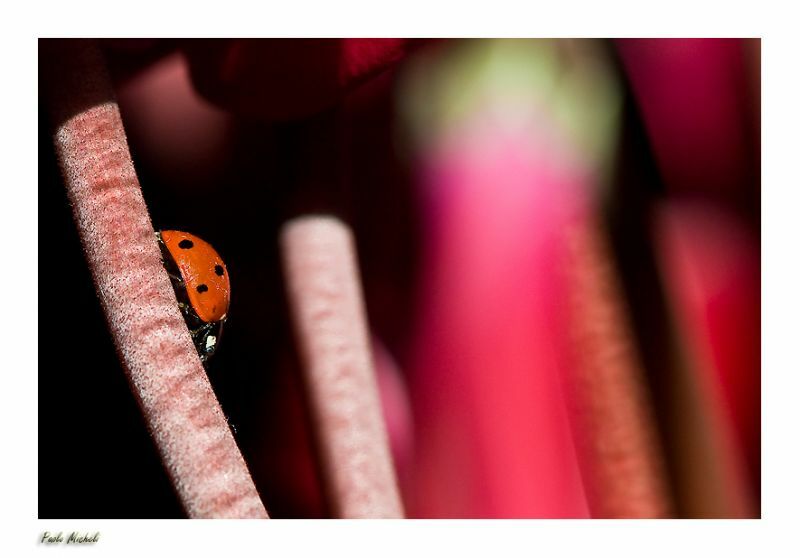 Laurie (Homepage) wrote: Such a dainty little ladybug...Beautiful shot. Ilan (Homepage) wrote: What a great colorful capture :D The reds control this photo which add to it's appeal. Nicely seen and captured! Andy (Homepage) wrote: Wow incredible macro photo of this ladybig! Really well done! Krims@nline.be (Homepage) wrote: Wonderfull image, great detail. Love the different tones of red and pink. Well done. Ps. Thanks for adding me to your vfxy collection (favorites/collection). I really appriciate it!